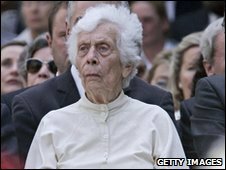 A prominent member of Germany's anti-Nazi resistance during World War II has died, aged 98, at her home in the US. Freya von Moltke, who had lived in Vermont since 1960, died last Friday after a viral infection, her son said. She had belonged to a group of aristocrats, clerics and diplomats who backed a failed attempt to kill Hitler with a bomb in 1944. The group, known as the Kreisau Circle, was led by her husband, Helmuth, who was later executed for his activities. She told an interviewer in 2002: "To object and then to stand for what you believe in is one of the most important human activities to this day." Von Moltke was born Freya Deichmann in Cologne in 1911 and met her husband when she was 18. Both she and Helmuth received law degrees and were married in 1931. They were opponents of Hitler from the start of the Nazi regime and assisted Jews and other victims of Nazism through Helmut's international law practice in Berlin. In 1942 and 1943, Von Moltke hosted meetings at the family estate, Kreisau in Silesia, at which the resistance group discussed plans for the democratic Germany they hoped would follow the collapse of Nazism. The Kreisau Circle supported the failed attempt on Hitler's life in July 1944. Von Moltke said later that she had fully supported her husband: "I never advised him to stop, but rather encouraged him, because I was convinced that that was the right way for him to fulfil his life." Helmuth von Moltke was executed for treason in January 1945. After the war, Von Moltke and her two sons moved to South Africa where she worked as a social worker. She returned to Germany in 1956 where she began her work in publicising the Kreisau Circle. She settled in Vermont in 1960, where she published several books about resistance to the Nazis during the war. The former family estate in Silesia, located in current-day Poland, is now used as a centre for reconciliation between Germany and Poland and as a meeting place to promote European integration.